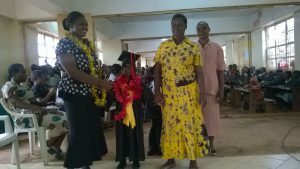 In this season of graduations, when students are finishing their academic year and preparing to move on to the next stage of studies, or in some cases finish with the formal education system for the foreseeable, we thought you might like to see a couple of photos of Graduation ceremonies at Spurgeons Academy, our CRED Partner in Kenya. 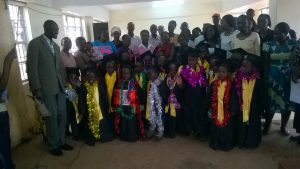 The school, which is in the heart of Kibera slum, and provides high-class education for some of the poorest and most vulnerable children, has two graduation ceremonies. One is for the oldest children in the school, when they finish P8 class. This is the last class that students have to officially do, and marks the end of the universal provision of education. After primary school, students have to pay school fees to be able to attend any school, as well as pass a national exam, and so for students in Kibera this is a tall financial order that many struggle to meet. As a result, whilst most P8 students aspire to go to secondary school, not all of them manage it, and instead many find themselves searching for work where they can find it. Thanks to the quality of education at Spurgeons Academy, most of the students do pass the required exam, and funds are sometimes found to help the students continue with their studies. In so doing, they get a better chance of a well-paid, relatively secure job, and the opportunity to work their way out of poverty. The other year group that has a graduation ceremony is the top class of the Pre-Unit or Kindergarten. 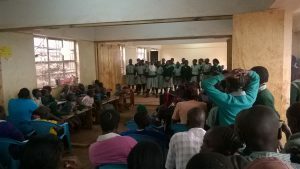 The Kenyan education system has 3 classes in this section: baby, middle and top classes, for children age 3 – 6 yr olds, and then after this they move on to Primary classes. The transition from Kindergarten to Primary 1 is seen as a significant milestone, and as you will see involves dressing up in gowns, wearing mortar boards and generally having a fuss made of them! 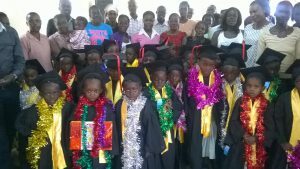 For children who have next to nothing at home, may be orphaned, or have parents who have travelled far away to try and earn money – the graduation ceremony, and the associated fuss that is made of them, is a very special time, and a key milestone in their young lives. Education is a vital part of being able to have a life that is more than just survival. The ceremonies that happen in Spurgeons, where each child is made to feel very special, and their achievements celebrated, are a reminder of that, and worthy of being remembered by us all. May everyone who is celebrating any sort of educational achievement at this time feel equally special, and proud of what they have attained.